A Chinese New Year greeting video released by the People's Liberation Army Hong Kong Garrison went viral recently, with netizens amused by its twist ending. The video, released by the garrison on Weibo Friday, first features a 10-second countdown, with footage of the garrisons’ soldiers and armored vehicles. 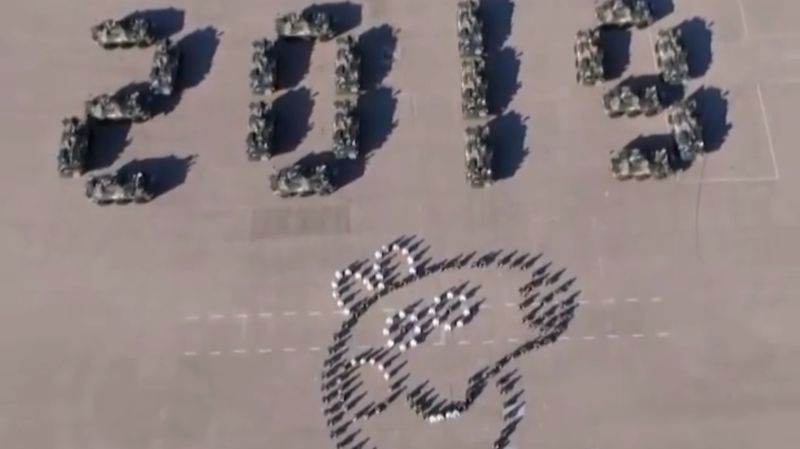 After the countdown, netizens were surprised to find the soldiers form the shape of Peppa Pig, a cartoon icon that has become the hottest frenzy in China after a six-minute video called “What is a Peppa Pig?” went viral. “You’ll definitely forward this video if you watch it till the end!” wrote one netizen. “Even the PLA uncles are so naughty!” another commented. By Sunday, the video has had nearly 4 million views.